Lawyers for victims of the Olympic Park bombing, including the family of a woman killed by the blast, told the Georgia Supreme Court on Monday that Atlanta's Olympic organizers should be liable because of a lack of security at the park. "For 22 minutes, they knew the bomb was there and people we represent were not warned or removed from the area," said Hardy Gregory, one of the lawyers for 37 of the bombing victims. The July 27, 1996, explosion during a free concert in the downtown park killed Alice Hawthorne of Albany and injured 100 others. Hawthorne's family and other victims sued the Atlanta Committee for the Olympic Games, corporate sponsor AT&T and two security companies, saying they failed to keep the park safe and did not adequately clear the grounds before the bomb exploded. The case has never been heard in court because a judge threw it out based on a Georgia law that protects property owners who make land available for public recreational use free of charge. Gregory told the court the Georgia Recreational Property Act of 1965 was intended to encourage farmers and other private landowners to open their land for activities like hunting, fishing or camping, not to protect profit-driven enterprises such as the Olympics. He noted that ACOG had a souvenir shop in the 21-acre park, AT&T sold pre-paid calling cards, Coca-Cola sold soft drinks and Anheuser-Busch had a beer tent. "The reason that people were invited there was not to give them a gift, but so AT&T, ACOG and other business enterprises could make a profit," he said. Ryan Mock, an attorney for ACOG, told the court that the open common areas of the park should be considered separately from the commercial vending areas. He said the justices should also consider that the park was intended as a place for Olympic visitors to mingle in the open, not to sell them souvenirs. "Clearly the primary purpose of Centennial Olympic Park was to provide recreation," Mock said. Hawthorne was the only person killed by the explosion. Her 14-year-old daughter was among those injured. Her husband, John Hawthorne, sued in July 1998 for unspecified damages. A mysterious 911 caller told Atlanta police that a bomb was in the park 22 minutes before it exploded. At nearly the same time, park security guard Richard Jewell spotted the green knapsack containing the bomb and alerted authorities, who tried to clear the area before the explosion. Gilbert H. Deitch, attorney for the Hawthorne family, said even if the court finds the law does apply to Centennial Olympic Park, there is still a jury issue on whether ACOG acted willfully. The law is written so that if the court finds ACOG acted with "conscious indifference" to the safety issues, the law would not provide immunity from liability, he said. In the lower court, Judge Charles L. Carnes rejected the victims' claims that the recreational property act ws unconstitutionally vague. The constitutionality issue means the case skipped the appeals court level and went directly to the state Supreme Court. AT&T managed the sound stage where the bomb exploded. Also named in the suits are two companies that handled park security, Anthony Davis Inc. and Borg-Warner Protective Services Corp. 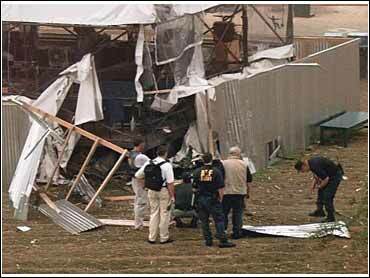 Fugitive Eric Robert Rudolph is charged with the Olympic Park bombing and with two 1997 Atlanta bombings. He is also a suspect in a 1998 bombing that killed a policeman at a Birmingham, Ala., abortion clinic.